In this world of 5G, Internet of Things (IoT). Things, talking to things. We are at risk more than ever before. With the use of Artificial Intelligence (AI), Machine Learning (ML), systems learning behaviors and the use of behavioral analytics. We are mostly confused as to where to turn to for advice, support and the right technology to underpin it all. With Artificial Intelligence and Cybersecurity, attacks are moving with a speed we haven't seen before. Or perhaps we haven't been paying attention! We must have a human overseeing security protocols and threats. Machine Learning Systems. It is important to declare the intentional use of a technology. Understanding the potential for abuse is foundational to this discussion. With pervasive threats from Internet of Things (IoT) and 5G, we must understand a secure IoT architecture down to its chip level. Separation of dependencies perhaps is a start here as complexity provides even more vulnerabilities. We need to have discussions with policymakers to think about creating a certification program. It becoming a requirement for small to medium sized businesses at different levels and in different countries. If a certification program is perceived by those in the industry as complex, then at least it will articulate risk and governance e.g. Where is accountability at all levels of this ecosystem? Independent testing certification groups are also fundamental perhaps at least in understanding the “known threat vectors.” Education and training needs to be offered to small and medium sized businesses and their suppliers. Certification programs must also become a requirement for governmental policymakers, because they must be current with their tools and procedures. Security is EVERYONE’s responsibility and perhaps penalties may be considered by government entities. However, the desired behavior has to be incentivized, encouraged, and even "Regulated" amongst our community. With Cyber Security, you're talking about safety, especially with Artificial Intelligence. I think with regard to Internet of Things (IoT) in a “Smart Home.” As an example, your attack surfaces are spread throughout your entire personal life so we need to address caution. We have to look at understanding what it means to have a particular device that monitors your temperature in the home, and cameras and so on and so forth. Because hackers will just hack! But then we have to think about state actors, because they've been ordered to hack they'll use all kinds of tools. Some are not as sophisticated as you think. So using Artificial Intelligence (AI) systems and the correct procedures and of course the right technology partners; we can stamp out most threats, if not all threats from attackers. What does the architecture look like at the chip level? How do you separate all of these services that are spread across everywhere? How do you make sure there's some hygienic stuff that's very, very basic? With Artificial Intelligence (AI) you have to break it down specifically to what you exactly want it to do. Machine Learning (ML) in Cyber Security involves machines learning behaviors. But we have to be consciously cognizant of what is going on. My thesis is that you will always need a human in the loop to interpret the information that's given to you, whether it's valid or not. Because you can try and do something, but when being attacked we only have minutes and seconds, seconds and minutes. For example with some colleagues, they had some wrong profiling. The last time I heard about it was with a lawyer! Profiling can happen because you have an accidental record of your name, confused with something else that's negative. Maybe you are associated because of the name clip with a bad actor perhaps, but that ruins your reputation. So we have to know what attribution looks like and then with Cyber Security because of Artificial Intelligence, and so on. Then you get into the notion of Cyber Warfare and that is a big concern because you're talking about completely borderless attacks and not just about moving tanks. You don't know who the people are. But attacks will happen at an economic level, potentially bringing down a critical infrastructure. Education is very important to make sure citizens, organizations and the government are cognizant of security and on top of education, partnering with leading organisations is key. Companies that are tried and tested are still always refining their protocols and systems and innovating in a stable environment. Are Our Current Workplaces Working? Work is an international right and there should not be discrimination of any sort. Three common types of discrimination are discrimination based on age, gender, or because someone is differently abled. But no matter the type, the bottom line is that everyone has not only the right to work but also the right to be treated with respect at their place of work. However, as the #MeToo movement has shown us, this is not always the case. You will sometimes find that it is hard to get a job if you are under the age of twenty-five (looking young and assumed lack of experience) or if you are over fifty (considered old and assumed that older talent doesn’t add as much value to the company). We need to stop with the Generation Z, Millennial, and Baby Boomer distinctions and value all people in the workforce; this means respecting employees for their contributions and not because they fit a certain mold. The question we must confront is how do we build companies that allow everyone to contribute? Besides these articles that lay out the rights, the UN Committee on Economic, Social, and Cultural Rights has agreed on three “As,” availability, accessibility, and acceptability and quality, to be interrelated features of creating the best workplace possible for all. It would seem that since there is a governing body over worker’s rights that there would be limited issues. However, there are multiple areas that need improvement. One such area is the ability of companies and workplaces to account for the differently abled. In some countries the issues stem from lack of educational policies for those that struggle in school because of their disability. For example, in India, oftentimes an improper learning environment for those with disabilities leads to students dropping out of school. This in turn limits their choices in the workplace. Countries such as Israel, are currently attempting to create more inclusive communities for the differently abled. Daniel is a community being built with the intention of creating an environment conducive to the success of those with disabilities. Meanwhile, The Finance Ministry, Israel Innovation Authority and Foundation for the Development of Services for the Disabled at the National Insurance Institute recently gave companies money to develop products to help those with disabilities. One company created “Open Sesame,” a smartphone app that allows those who cannot use their hands to use a smartphone. A technology such as “Open Sesame,” is pertinent to the success of those with disabilities in the workplace, as oftentimes not being able to type or use one’s hands will prevent them from obtaining a job, as these are skills that many contemporary jobs require. It is encouraging to see Israel making these strides for more inclusivity for the differently abled, and other countries and companies should follow in its footsteps. 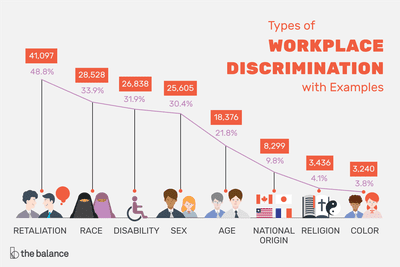 In addition to the differently abled, those of certain ages also experience discrimination in the workplace. “Two out of three workers between ages 45 and 74 say they have seen or experienced age discrimination at work.” And the United States Supreme Court may have upped this statistic when it ruled in 2009 that one must meet a “higher burden of proof” for age discrimination as opposed to other types of discrimination. And Americans are not happy about it, as eight in ten Americans desire for Congress to create stronger laws to prevent age discrimination. The Centre for Ageing Better conducted a survey and found that half of those surveyed over 50 years old believe that they would be at a disadvantage if they applied for a new job. Part of the problem surrounding age discrimination stems from recruitment policies, which often ask for birth year or graduation date, thereby aging a person. Companies can create policies to prohibit age discrimination in the workplace, and there are venues for those who have experienced age discrimination to take action. Some companies which are making the strides to do things differently include Barclays, Boots, Aviva, and the Co-Op, which are all trying to increase their number of employees over fifty years old by 2022. Companies also need to find ways to integrate Baby Boomers into workplace along with Gen Z. It is a simple fact that people are retiring later. Older generations have skills that millennials do not like understanding human side of business, and vice versa. On the employee end of the spectrum, if employees have experienced age discrimination at work they can sue their company or file a charge with the Equal Employment Opportunity Commission. However, companies should implement policies so that it does not come to this step. Large companies have recently gotten in trouble for discrimination against both women and men. In terms of discrimination against women, Microsoft has been sued for gender discrimination as well as sexual harassment, as has Computer Sciences Corporation. Walmart and Quest Diagnostics and AmeriPath were also brought to court for gender discrimination. In terms of discrimination against men, Entura Capital, a beauty company, was sued for refusing to hire men as Sales Reps, and Lawry’s, a corporation operating restaurants, was sued for only hiring female servers. In addition, Yahoo was sued and the Jimmy Fallon Show, for preference toward women. As these issues come to light so has a mission to stop it. The #MeToo movement has highlighted major public figures for sexual harassment, including Harvey Weinstein, Bill Cosby, Matt Lauer, Charlie Rose, and James Levine. While stemming from a terrible source, hopefully the #MeToo movement is helping to bring some of these gender discrimination issues to light. When looking forward to a new year, many people look toward the goals they set (and probably won’t meet) and what’s literally to come, whether that’s a new iPhone, car, or digital technology. For example, In 2019, we will most likely see additional applications of blockchain to other industries, new breakthroughs with AI, and the 3D printing of metals, which will have a large impact on the manufacturing industries. These technologies will revolutionize our immediate future, but their current applications also allow us to hypothesize about what they will enable us, as human beings to do, not just in 2019, but beyond. Technology will certainly be a part of redefining what humans are in the future. We already know that blockchain will impact humanity, as we have seen through its work with refugees. In the future, blockchain will certify identities. This will blur the lines of nations and turn individuals into their own states. We will become autonomous creatures, certifying ourselves. Using this idea of the state dissolving, the thesis is that people will tire of “things happening to them” and will create like-minded tribes using technology to further democratize the world around them. For example, there will be Social Responsibility tax for funding, which will support the climate. And just forget about the stress of the holiday travel. Artificial Intelligence will enable teleportation. Not only will technology essentially erase governments, but it will become one with humans. What does this mean? Our brains will become our devices, as we “read’ other people. Creeped out by this? Never fear! There will be a “do not share capability.” And, since our brains are now technology, we will be able to absorb knowledge in seconds. But, what if you are tired of being forced-fed content? Individuals will be able to co-create scenes at any time and be paid for the co-creation. Lack of privacy and the elimination of randomness from the human experience will be the downside, leading to cries for a “serendipity on or off button.” Individuals will have to be cognizant of their privacy being abused, and might want to demand payment for the use of their identities as product. Maybe a great tradeoff for the elimination of privacy and randomness, is the possibility that we may never have to say goodbye to those individuals who have graduated to a newer dimension that we define as death. Whether we will have the ability to keep our consciousness alive via software or create an avatar of ourselves or loved ones, there is a very real possibility we will see people’s representation after what we define as death. Moreover, we will be able to protect ourselves to a greater extent with human enhancing tools at our disposal, including personalized home robots. In my future, the technology of today will enable me to “see” or “hear” people whom I’ve met before. I may activate my “invisibility” option as to declare that I do not wish to be disturbed. My memory catalogue will be a service to me and potentially to others. In the words of Nikola Tesla “the present is theirs; the future, for which I really worked is mine.” The present is all these technologies, but this is the future for which I am working. As you look toward 2019 and beyond, what are you working for? Data driven recruiting is here, but is it really up to the job? Advanced tech like AI is solving problems in almost every area in business, but are some of the newest solutions brought to human led departments like HR actually bringing us farther from a diverse and innovative workplace? New companies like HireVue offer an AI element of recruiting that we haven’t seen before. As interviewees answer questions into a video recording the software is picking up subtle cues based off of psychological science that points to the kind of person they are and what kind of talent you will be receiving. The system allows the interviewer to watch back the session, but also to see the data that the AI picked up that the interviewer might’ve missed had it have just been them in the room. AI has also been introduced to the beginning steps of hiring, by using its software to screen possible candidates and find the best matches available, saving recruiters almost 30% of their time. But are these programs always the perfect solution, and can AI really be ethically neutral? The algorithms that you find in these programs use small facial cues to deduce reasoning, but are we to expect that it can truly capture all complexities? This notion that everything that we present through our emotions and reactions can be simplified down to a science may be naive. The process also puts a lot of weight on emotion, but doesn’t allow for the ability behind the interviewee to shine through, which could lead to passing up possible candidates that don’t perform well in an interview setting. It is that bit of human intuition that allows recruiters to see past small ticks in an interview that this software just can’t replicate. These programs were also proposed to reduce bias, but could end up inviting a different kind of bias to the table. As people begin to be hired based on the way they act it could force new recruits into a homogenized behavior that they know will get them the job. This may force out-of-the-box recruits that are often some of our greatest thinkers to the bottom of the pile. Even though companies are saving time, and sifting through more talent, it may come at the cost of a different type of diversity. We also have to remember the many different people looking for work. The needs of everyone may not be met with just a video representation of their skills. Think of a prospective employee with autism, or a similar type of ailment that doesn’t allow them to interact in a way that fits the social norms built in to these programs. We may be able to save time with new tech, but completely removing a human element may poorly serve the fringe communities or minority groups. Technology will, and should, continue to push every industry forward, but it is up to us to question its validity and its shortcomings. Machine learning may fix these issues at some point, but until that is obvious it is paramount that we pad our technology additions with the humanized part of hiring. By the end of 2020, it’s predicted that there will be over 50 billion connected devices, all of which set the stage for millions of data transactions. As we move forward in this connected, digital first world, data is becoming a new kind of currency, or more so, we’re moving into a data economy. But in this new economy, privacy, which is a fundamental human right, becomes harder to maintain. Following several leak instances (think: Equifax), it has become apparent that consumers’ security and privacy is constantly at stake. Particularly in the realm of healthcare (where security-privacy is critical), it’s time for blockchain to step up to the plate. So what’s the promise of blockchain for healthcare? The idea is simple. Centralized systems are not secure and are easily corruptible, as well as vulnerable to cyberattacks. Blockchain systems on the other hand, are decentralized and not prone to attack, because no one control system has the key to the data. This is where blockchain and health care intersect. Blockchain networks have the potential to keep data private and secure, even among billions of connected devices. As Dr. Frances Hughes, healthcare activist and professional, states, “patients and consumers lack transparency, as well as health literacy, when it comes to some of the biggest decisions regarding their own lives and bodies.” Blockchain’s implications for reshaping health care are its abilities to provide “real time research data” when it comes to pharmaceutical safety and trials, audit and accreditation agencies, compliance processes, etc. With blockchain, the patient and consumer becomes fully in control of his/her own data, challenging the power structures of health providers and funders/insurers. No longer having healthcare services captured under others’ licenses, insurers, hospital administrators, etc. means transparency like never before, as well as security and trust. As Entrepreneur examines, blockchain harnesses the power of encryption to assert its own immutability, and become a safer option than any physical database. Blockchain, unlike anything else, places the patient at the center of the healthcare ecosystem. But blockchain’s value across healthcare extends to more than just security-privacy. A common database of health information for doctors, providers, and patients to access at all times can also result in more time spent on patient care, better sharing of research results for new treatments, enhanced drug development through result accessibility, and even minimization of claim and billing fraud. Most radically, blockchain can transform medical innovation—and perhaps even the prediction and prevention of cancer. As Nasdaq reports, a person’s genomica data holds high market value, and a startup called Shivom (which utilizes blockchain technology) is partnering with leading molecular diagnostics company Genetic Technologies (GTG) to accelerate the prediction of cancer for millions of individuals. “The low-cost management of data that it enables allows us to revolutionize how genomics is presented to the world, co-founder and COO of Shivom, Gourish Singla, says of blockchain. Shivom’s blockchain-centric healthcare platform puts ownership of data right into the hands of individuals, and integration of such a database enables GTG to better identify, and thus prevent, cancer risks. THAT’s just one example of why blockchain could be the future of healthcare. Like other industries, blockchain has the potential to radically disrupt the industry—and healthcare is an industry long due for disruption.